Watch the fight replay of UFC 188: Cain Velasquez vs Fabricio Werdum including fight results. UPDATE: Fabricio Werdum defeated Cain Velasquez and becomes the undisputed UFC heavyweight Champion of the world! 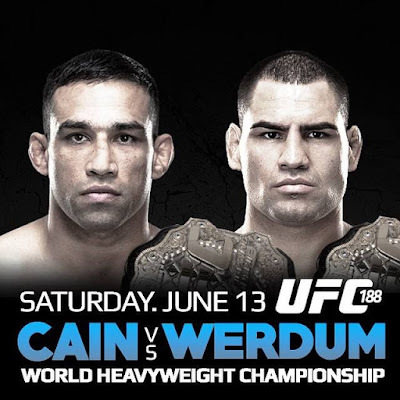 In the main event at UFC 188: Velasquez vs. Werdum, we unify the UFC Heavyweight titles as Heavyweight champion Cain Velasquez (13-1 MMA; 11-1 UFC) faces Interim Heavyweight champion Fabricio Werdum (19-5-1 MMA; 7-2 UFC). This five round title fight caps off the five fight UFC 188 PPV main card. The UFC Rankings have both men at the top of the division obviously, with Cain also sitting at #4 on the pound for pound list and Werdum at #14. UFC 188: Velasquez vs. Werdum airs live from Mexico City, Mexico this Saturday, June 13. The main card airs on PPV with a fight time of 10:00 p.m. ET / 7:00 p.m. PT, with the prelims starting at 8:00 p.m. ET on FX and 6:30 p.m. ET on Fight Pass.